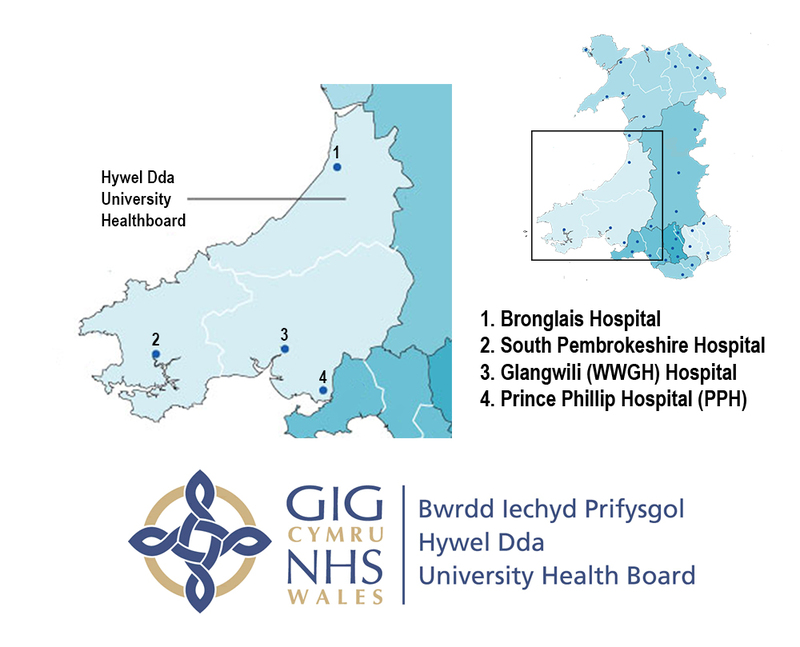 Covering the west Wales region including Carmarthenshire, Ceredigion and Pembrokeshire, Hywel Dda University Health Board provides healthcare to around 384,000 people. 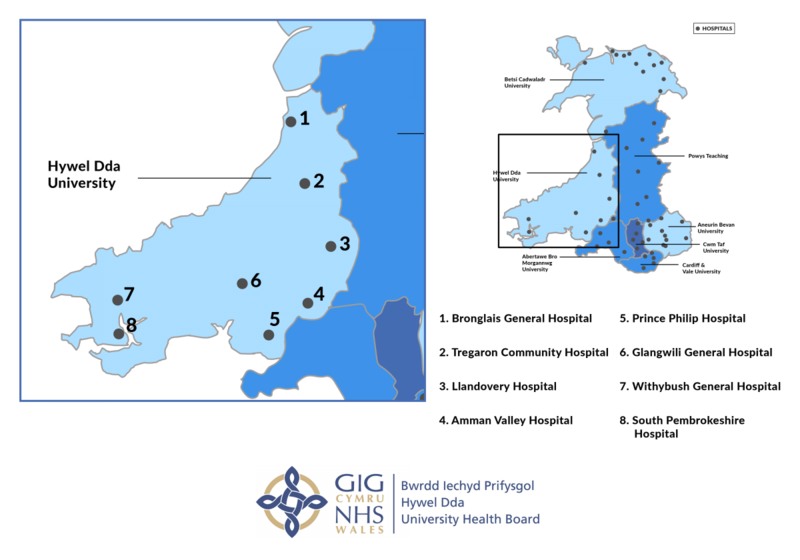 It has the highest budget overspend of all the Wales health boards, partly due to problems attracting and retaining staff in its rural locations. Amman Valley Community Hospital in Glanaman has a 28-bed ward and a day care unit for people who need care and rehabilitation before they can return home. Originally the private home of manager of the Amman tinplate works in Garnant, the hospital also provides end of life care. Bronglais Hospital in Aberystwyth serves a geographically large and mainly rural area. It has an A&E department, but its relatively small size means some patients are referred to hospitals in Carmarthen, Swansea and further afield. It has midwife-led maternity services, general surgical, trauma and orthopaedics services and mental health services for older people, as well as a stroke ward. Specialisms: A cancer information and support centre was opened at Bronglais in 2016. 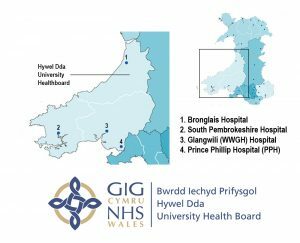 Formerly West Wales General Hospital, Glangwili serves Carmarthen and the surrounding area and provides surgery, trauma and orthopaedics, gynaecology, ENT and ophthalmology services and stroke and rehabilitation facilities. It has midwife and consultant led maternity units and runs Welsh medium antenatal classes. Specialisms: Plans are underway to improve maternity and neonatal services and add two birthing rooms following Welsh Government investment in 2017. Llandovery Hospital has a minor injuries clinic, x-ray facilities, outpatient physiotherapy, podiatry, cardiac rehabilitation classes, phlebotomy, antenatal classes and consultant outreach clinics. Home-based occupational therapy and physiotherapy services are also run from the site. The Llanelli hospital provides surgery, trauma and orthopaedics, gynaecology, ENT and ophthalmology services, as well as stroke and rehabilitation facilities. A new minor injuries unit and acute medical assessment unit replaced A&E in 2016, despite a legal challenge. Run by GPs and emergency nurse practitioners, Prince Philip Hospital treats a range issues such as muscle and joint injuries, burns and scalds, minor head injuries, minor eye injuries and many more. Senior doctors and nurses in the AMAU will also see patients with medical conditions including strokes and chest conditions. Originally built as a naval hospital in 1902, this community hospital in Pembroke Dock now has 35 inpatient beds and five social care beds. Services at South Pembrokeshire Hospital include a rehabilitation ward and day unit and outpatient and physiotherapy services. A 29-bed community hospital, Tregaron Community Hospital specialises in rehabilitation and palliative care. Withybush is a 300+ bed district general hospital in Haverfordwest, and one of Hywel Dda’s four acute general hospitals. Services include antenatal, colposcopy, physiotherapy, rehabilitation, adult speech and language therapy, cardiorespiratory, day surgery, MRI facilities and radioloogy. BBC Wales reported early in 2018 that Hywel Dda is considering a range of cost-cutting measures, several of which would see the closure of Withybush.